01: After you have removed your clock as per your Corvette shop manual’s instructions, you will need these tools and supplies for the conversion: Small pliers, needle nose pliers, flat blade screwdriver, 5/16″ nut driver, needle paint, paint brush, bezel paint, new clock lens and quartz movement. 02: Hold the set stem with a pair of pliers and unscrew the set stem knob counter-clockwise. You may have to hold the stem with one pair of pliers and twist off the set knob with another pair. 03: Use the flat blade screwdriver to open the crimped areas where the two halves of the clock housing come together. After they are open, carefully separate the two halves. 04: Take the nut driver and remove the power terminals so that you can remove the clock movement from the housing. Make a note as to how the terminals are aligned. When you re-assemble the clock, the terminals will have to be aligned as they were originally to accept the clock power source plug. 05: Carefully grab the clock hands underneath their hubs and remove them one at a time. 06: Now is a good time to polish and re-paint your Corvette’s clock hands. This way they will be dry when you re-assemble the clock. The needle paint is very thick so you will want to make viagra sans ordonnance your brush strokes in one pull on each side of the needle. This will eliminate unsightly brush strokes. 07: After the needles are removed, you can then remove the dial face. Carefully straighten the tabs and remove the face. 08: Remove the dial plate nuts or retainers and the grommets. (New retainers and grommets are provided.) Now you can remove the old movement. 09: You will need to remove and save the old minute wheel and hour wheel assemblies and washers. 10: Install the new dial plate grommets into the dial plate. 11: Install the minute wheel, new motion wheel, hour wheel, new idler wheel and hour washer onto the quartz movement as per the instructions. Make sure that the power terminal on the new quartz movement is the same as the old movement. Make sure that you use only the new color-coded gears that match the number of teeth in your old gears. 12: Install the movement onto the dial plate and fasten the movement with the retainers or dial plate nuts. Now re-align the dial face and bend the tabs over to secure the face to the dial plate. 13: Align the clock hands at twelve o’clock and carefully push them onto the center shaft. Hour hand first, minute hand second, second hand last. 14: We wanted to replace our lens and re-paint our bezel so we first had to separate the bezel from the clock housing. Use a flat bladed screwdriver to push in the bezel retaining tabs. After the bezel is separated from the housing, use a flat bladed screwdriver to carefully remove the inner clock finish bezel from the housing. Pry it up over the clock bezel tabs. After the inner bezel is removed, you can then remove the lens. If your bezel has a chrome edge, cover this with 1/8″ masking tape before you begin painting. 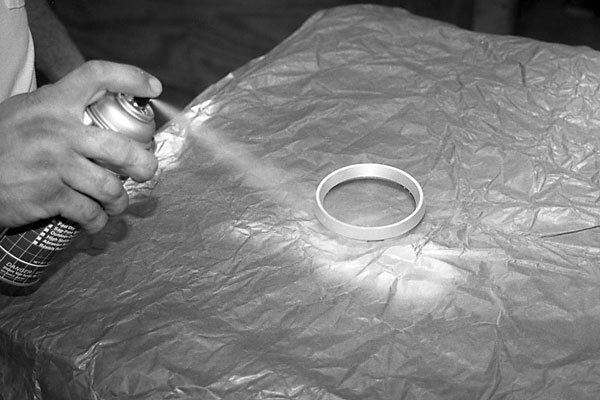 15: Now clean the bezel and then use a 3M scuff pad to prepare the surface for refinishing. Remember to clean the painted surface of the bezel with a tar and wax remover, PrepSol or acetone to remove any type of grease or silicone. 16: Zip Products provided us with the correct silver for our bezel. Spray this paint on in 2 or 3 light coats. This will give it the right appearance without any runs. 17: After the bezel has dried thoroughly, align your new lens into place and set it into place. 18: Set the housing half and clock inner bezel onto the mounting tabs. Place a flat bladed screwdriver between the two tabs and tap the top of the screwdriver firmly with your free hand. This will cause the housing and bezel to snap back over the mounting tabs. 19: Align the mounting tab on the housing and re-crimp the two halves back together. 20: Make sure the power terminals are aligned correctly to accept the power source plug. 21: Here is the finished Corvette clock completed and ready to be re-installed and you can say you did it yourself.